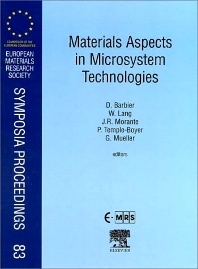 Chapter headings and selected papers: Materials Deposition and Microstructuring. Plasma enhanced chemical vapor deposition silicon oxynitride optimized for application in integrated optics (K. Wörhoff et al.). Roughning and smoothing dynamics during KOH silicon etching (R. Divan et al.). Silicon elastomer as a protective layer in 3D microfabrication of micro-opto-electro-mechanical systems (P. Obreja et al.). Multilayer structures deposited by laser ablation (M. Dinescu et al.). Growth of piezoelectric thin films with fine grain microstructure by high energy pulsed laser deposition (F. Craciun et al.). Micromachining of magnetic materials (A. Kruusing et al.). A high temperature pressure sensor prepared by selective deposition of cubic silicon carbide on SOI substrates (M. Eickhoff et al.). New metallurgical systems for electronic soldering applications (C. Gonçalves et al.). Obtention and characterization of bioengineered layers onto silica-based microstructures (S. Falipou et al.). Microstructure of Cu-C interface in Cu-based metal matrix composite (A. Berner et al.). Porous Silicon in Microsystems. Thick oxidised porous silicon layers for the design of a biomedical thermal conductivity microsensor (P. Roussel et al.). Porous silicon technique for realization of surface micromachined silicon structures with large gaps (H. Artmann, W. Frey). Galvanic porous silicon formation without external contacts (C.M.A. Ashruf et al.). Characterization. Determination of micromechanical properties of thin films by beam bending measurements with an atomic force microscope (C. Serre et al.). Characterization and modeling of a CMOS-compatible MEMS technology (L. Latorre et al.). Characterization of the nonlinear optical properties of crystals by the SHEW technique (R. Kremer et al.). Bonding and Packaging. Wafer bonding for microsystems technologies (U. Gösele et al.). Selection of materials for reduced stress packaging of a microsystem (A. Morrissey et al.). Devices. Microstructures of the monomorph piezoelectric ceramic actuators with functional gradients (X. Zhu et al.). Micromachined chemical reaction system (M. Koch et al.). Electrostatically actuated micromirror devices in silicon technology (W. Lang et al.). Integration of a sensitive material to a silicon-based device for CO detection (O. Renault et al.). A thermoelectric converter for energy supply (H. Glosch et al.). Author index. Subject index.